Want to fly through the underwater seamounts of the Phoenix Islands? Now you can, thanks to Dr. Peter Etnoyer's Google Earth fly through. Peter is a Marine Biologist at the NOAA Center for Coastal Environmental Health and Biomolecular Research (CCEHBR) and proud owner of a plot of ocean in the Phoenix Islands on the Aquarium's Live Blue Initiative. Watch the video below and consider how much is left to explore of the Phoenix Islands Protected Area (PIPA). 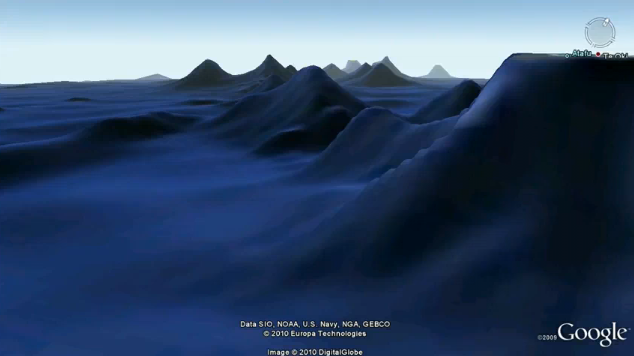 Although the 2009 expedition began blue diving and recording data with Remote Operated Vehicles, most of what we know about PIPA is located on the tips of those mountains, and not the vast expanses below. "The Phoenix Islands Protected Area (PIPA) is the largest Marine Protected Area (MPA) in the world. It's the size of the state of California. Most of the attention to PIPA is drawn by the colorful coral reefs that surround each of the eight atolls in PIPA. But the coral reef environment is a tiny fraction of PIPA. By far, more than 99% of the ocean habitat in PIPA consists of the pelagic environment, the place where a vast array of invertebrates live and drift around; also the area where schools of tuna, pods of whales and dolphins, seamounts, deep sea creatures, many of which await discovery. " "Unlike beaches or even coral reefs, most people will never see a seamount, but this study shows that they are clearly one of the predominant ecosystems on the planet. We can only hope that through this study, people begin to realize what a vast unknown the ocean represents, and what a vital role it plays on Earth." -Peter Etnoyer, Ph.D., principal investigator of the study and marine biologist at NOAA’s Center for Coastal Environmental Health and Biomolecular Research.